Winstar slot is one of the most simple games you'll ever play, and possibly the most profitable if you get really lucky! 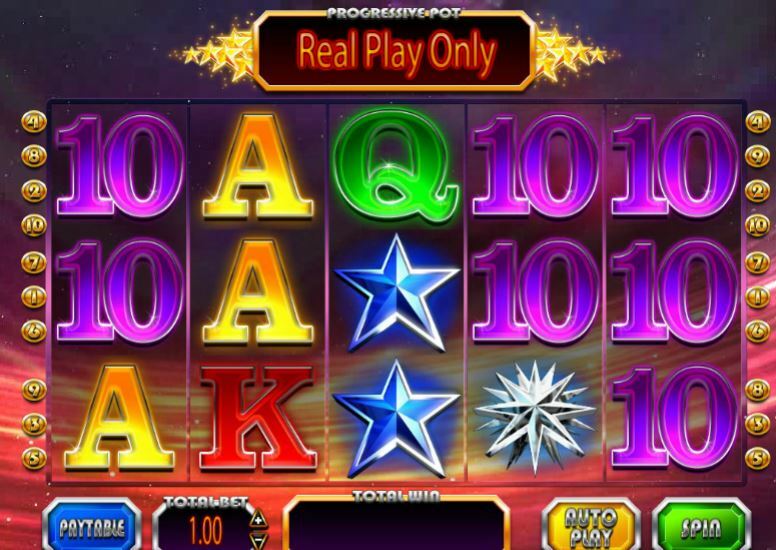 It resembles other games such as Netent's Starburst and Nextgen's Starmania but has the volatility of the brutal Novomatic slot Power Stars. Unlike those games you can win a progressive with this one, but otherwise the set-up is pretty similar as we shall discover. 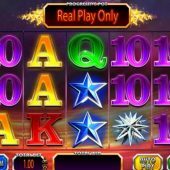 We have transparent reels over a starscape graphic and some quite urgent but catchy techno beat music as we spin, but will Winstar be more of a black hole for your playing balance? All symbols are stacked and like the comparison slots above we get 5 reels of 3 rows so it is possible to get a full screen of any icon. The pays are all adjacent on the 10 pay lines, which means we can win with any 3 consecutive symbols on a line. You would get 500x bet for a screen full of white stars, the top pay or 50x for a 5-of-a-kind win. Red stars pay 40x, blue or green 30x with A or K at 20x and the remaining 3 card values paying 10x for the full line. There are stacked Gold Stars on all reels and when these land they will all spin a few times then reveal the same symbol underneath, which may or may not assist you in your quest for a win. From time to time on random spins one or more reels may appear to land with gold edges to them. Should all 5 come to a stop with the Gold boxes surrounding them, you win the casino's progressive for the game. The higher the bet, the more likely this is though.